Jupiter hit by asteroid or comet in March 2016. Jupiter Got Whacked by Yet Another Asteroid/Comet! Wham! From 665 million km away an asteroid or comet was seen impacting Jupiter (arrowed). Three moons are visible too: From left to right, Europa, Ganymede, and Io. 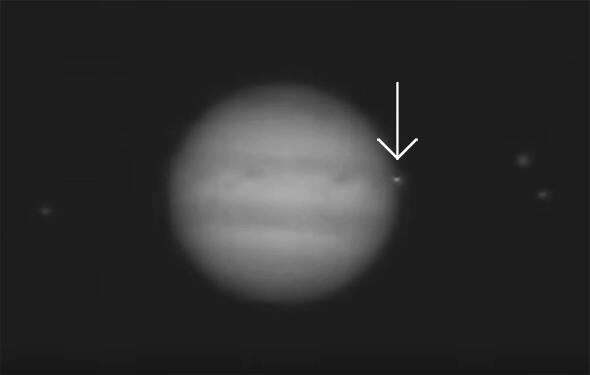 On March 17, Gerrit Kernbauer, an amateur astronomer in Mödling, Austria, was taking video of Jupiter using a 20 cm telescope. This is a common technique to capture thousands of frames of an object, so that the best parts of each frame can be teased out to create a high-resolution image, removing the distorting effects of the atmosphere. Whoa. The flash is very brief but definitely there. When I first saw the video I thought it looked very much like an impact, but it could have also been a reflection inside the telescope, or many other non-impacty things. To confirm it, what we really need is a second observer who happened to be looking at the same time. That was taken by John McKeon, observing with a 28 cm ‘scope in Swords, just north of Dublin, and the timing is consistent with what’s seen in the first video. I would say this is very strong evidence for an actual impact. As to what did the impacting, that’s less clear. It could be either a small asteroid or a small comet. Given how brief the flash was, and how bright, I’m sure it wasn’t terribly big, probably in the tens-of-meters wide range. I know that sounds small, but remember, Jupiter has ferocious gravity, and velocity is critical here! The energy released by an object slamming into another depends linearly on the mass (double the mass, double the energy), but on the square of the velocity: double the velocity, quadruple the energy. On average (and ignoring orbital velocity), an object will hit Jupiter with roughly five times the velocity it hits Earth, so the impact energy is 25 times as high. The asteroid that burned up over Chelyabinsk, Russia, in 2013 was 19 meters across, and it exploded with the energy of 500,000 tons of TNT. Now multiply that by 25, and you can see how it doesn’t take all that big a rock to hit Jupiter for us to be able to see it from Earth. Incidentally, at these huge speeds, hitting the atmosphere is like slamming into a wall. A lot of people get understandably confused how an asteroid can explode due to air, but the pressures involved as it rams through the atmosphere at these speeds are ridiculously huge. The air and rock heat up, the rock starts to fall apart, and each chunk then gets hot, and so on, creating a very rapid cascade that releases the energy of motion in just a second or two. Bang. Very, very big bang. Jupiter gets hit a lot. We’ve seen impacts like this before, many times in fact! The most famous is the string of impacts from the comet Shoemaker-Levy 9 in 1994, which hammered the planet over and again as the comet, broken into a dozen separate pieces by Jupiter’s gravity, slammed into the planet and exploded. In 2009 something relatively big hit the planet (and Hubble caught the aftermath). It was hit again in June 2010 (with a cool color photo this time), and then again in August 2010. A repeat performance was held in September 2012. Image from the June 2010 impact. Looking over these observations, it seems that on average Jupiter gets hit by something big enough to see from Earth about once per year. Mind you, we miss ones that happen on the far side of the planet, or when Jupiter is too close to the Sun to be observed. I’ll note that Jupiter has always been getting hit, but the uptick in detections is because our technology is getting better and less expensive. You don’t need a zillion dollar observatory to catch something like this; an off-the-shelf telescope and video camera can do the trick. I’m not saying it’s easy; astrophotography still takes skill and patience. But there is no lack of talented and eager amateur astronomers out there willing to put in the time. 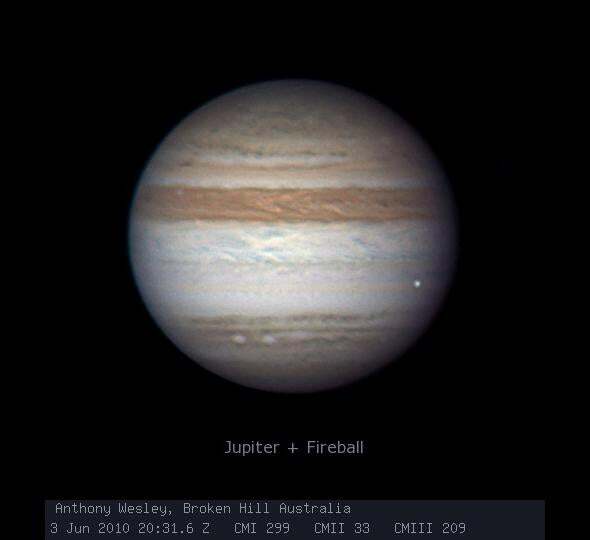 If I had had tech like this when I was in high school and observing in my yard every clear night, I’d have been videoing Jupiter every night it was up! The hard part, though, is actually finding the event in the footage. As you can see, it only lasts for a second or so, which might be hard to spot in hours of footage. Kudos to the two (so far) who did manage to see it. So it’s worth the call: If you happened to be taking video of Jupiter that night, please let me know. I don’t think any big observatories will be following up with this event (it wasn’t big enough to leave any visible damage in the cloud tops), but the more info we have on it, the better.